Los Angeles (November 12, 2018) – Opera aficionados throughout the United States of America are in for a treat this holiday season. In a partnership with Auditorium Films, myCinema announced today the exclusive cinematic release of The Monte Carlo Opera Production of “Don Giovanni” – the classic and world-famous opera by Wolfgang Amadeus Mozart. 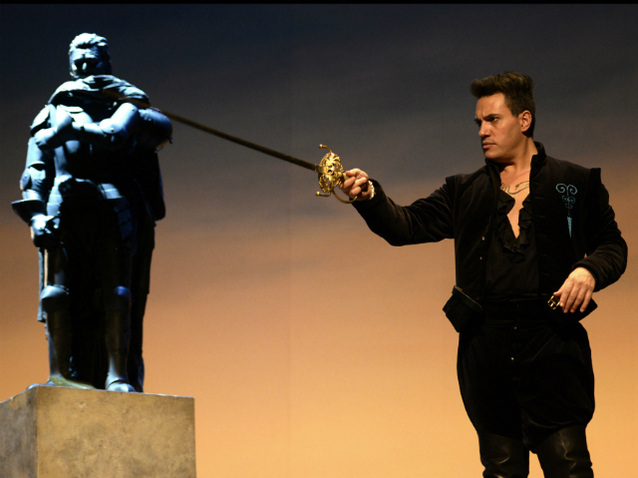 World renowned bass-baritone Erwin Schrott is featured in the lead role. In this screen adaption of Mozart’s greatest opera, Don Giovanni, the infamous womanizer, makes one conquest after another until the ghost of Donna Anna’s father, the Commendatore, (whom Giovanni killed) makes his appearance. He offers Giovanni one last chance to repent for his many improprieties. He will not change his ways. So, he is sucked down into hell by evil spirits. High drama, hysterical comedy, magnificent music! Auditorium Films is an international content distribution company, specialized in art and music programming, founded in 2015 by Réza Ackbaraly, former head of the Jazz & World division at the pay-tv channel MEZZO. An initiative of Nagra (Kudelski Group), myCinema leverages its breakthrough digital content delivery system to distribute movies, live entertainment and e-sports/gaming opportunities for the growing network of myCinema theatrical exhibition partners. More about the excellent content opportunities from myCinema are available at www.mycinema.live.